Thomas Paschos, Esq., Kelly A. Lavelle, Esq. Autonomous vehicles (“AVs”) will have a huge impact on the automobile insurance industry. A study done by Stevens Institute of Technology estimates that there will be 23 million autonomous vehicles on U.S. highways by 2035. However, with consumer hesitation and other hurdles, it may take decades before self-driving cars are fully adopted. As a result, there will likely be a transitional period where both self-driving vehicles and human-driven vehicles are on the road, presenting insurers with some challenges. Once autonomous vehicles are fully adopted, there will be new risks to insure, such as equipment failure, hacking and other new technology. Source: NHTSA, Automated Driving Systems 2.0: A Vision for Safety. Considering the majority of accidents involve human error, the promise of autonomous vehicles could have a negative an impact on collision underwriting as it delivers even greater benefits to society. Some of the benefits of autonomous vehicles include increase in safety, economic and societal benefits, efficiency and convenience and mobility. Safety – Automated vehicles’ potential to save lives and reduce injuries is rooted in one critical and tragic fact: 94 percent of serious crashes are due to human error. Automated vehicles have the potential to remove human error from the crash equation, which will help protect drivers and passengers, as well as bicyclists and pedestrians. When you consider more than 35,092 people died in motor vehicle-related crashes in the U.S. in 2015, you begin to grasp the lifesaving benefits of driver assistance technologies. Economic and Societal Benefits – Automated vehicles could deliver additional economic and additional societal benefits. A NHTSA study showed motor vehicle crashes in 2010 cost $242 billion in economic activity, including $57.6 billion in lost workplace productivity, and $594 billion due to loss of life and decreased quality of life due to injuries. Eliminating the vast majority of motor vehicle crashes could erase these costs. Efficiency and Convenience – Roads filled with automated vehicles could also cooperate to smooth traffic flow and reduce traffic congestion. Americans spent an estimated 6.9 billion hours in traffic delays in 2014, cutting into time at work or with family, increasing fuel costs and vehicle emission. With automated vehicles, the time and money spent commuting could be put to better use. A recent study stated that automated vehicles could free up as much as 50 minutes each day that had previously been dedicated to driving. Mobility – Automated vehicles may also provide new mobility options to millions more Americans. Today there are 49 million Americans over age 65 and 53 million people have some form of disability. In many places across the country employment or independent living rests on the ability to drive. Automated vehicles could extend that kind of freedom to millions more. State Laws: Nevada was the first state to allow the use of autonomous vehicles in 2011. 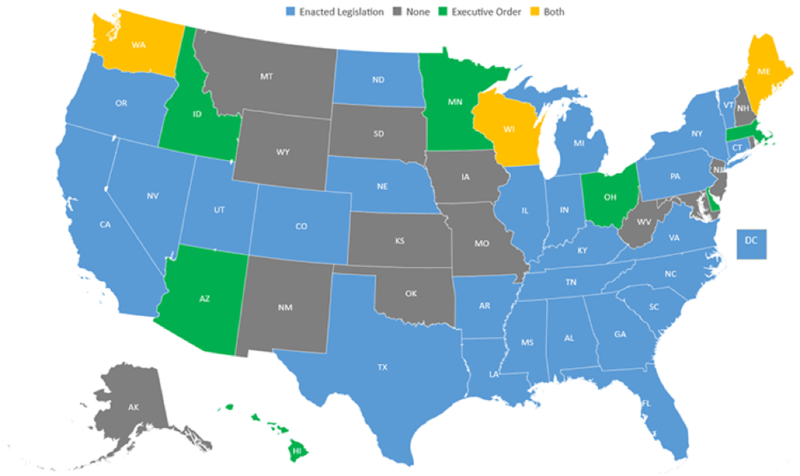 As of June 2018, 29 states and Washington, D.C., have passed autonomous vehicle legislation. The state laws vary widely in intention and implementation. Source: National Council of State Legislatures. To date, only a few states have begun to address insurance-specific issues with respect to AVs, and those are focused on AV testing requirements. International: The UK is undoubtedly leading the way with the passing of the Automated and Electric Vehicle Bill (AEV). This puts into place the regulatory framework that will allow insurers to insure automated vehicles when they start appearing on the road but questions still remain about how insurers will be given access to crucial post-crash data, without which insurers will be unable to determine the cause of the accident. The need for insurance doesn’t end with autonomous vehicles, it just changes. Policies will still need to address variables, such as equipment failure, internet connectivity interruption, or even hacking. Complex insurance and liability issues could emerge from vehicles performing according to design, yet resulting in unanticipated side-effects. Also, extensive insurance coverage litigation will very likely take place at the inception of this new technology. A group of insurers, consultants, and attorneys recently published a whitepaper on insuring autonomous vehicles: Insuring Autonomy, How auto insurance can adapt to changing risks, Travelers Institute White Paper (July 2018). The White Paper includes two key proposals: (1) that traditional tort liability and automobile insurance will be able to efficiently handle risk transfer for accidents involving automated vehicles; and 2) auto insurance for AVs will need to include a cyber-insurance component. Travelers is very likely correct in its assessment that traditional tort liability and automobile insurance will be able to effectively and efficiently handle risk transfer for accidents involving automated vehicles. If that is the case, then the insurance and legal communities should be involved in the initial discussions with the manufacturing communities regarding insurance and liability issues with AVs. Further, automobile manufacturers are not equipped to underwrite insurance policies and risks associated with AVs. The question of who is liable in an accident involving an autonomous vehicle is fundamental to the future of motor insurance industry. With the transition to autonomous vehicles, some in the insurance industry are already envisioning the need to gradually move from individual coverage to insuring car manufacturers. It seems to be the consensus at this point that when an accident occurs without the involvement of a human driver, the manufacturer will, most likely, be liable. But, from a public policy prospective, it may be too costly and time consuming to require every injured party involved in “fender bender accidents” and even very serious accident with AVs to bring a product liability action. Such actions are extremely complex and take years to litigate. Some legal and insurance professionals are even theorizing about the need for a No-Fault type litigation model with AVs. Google, Volvo, and Mercedes-Benz have already accepted liability in cases where a vehicle’s self-driving system is at fault for a crash. Tesla is taking things a step further by extending an insurance program to purchasers of Tesla vehicles. However, if car manufacturers face increased operating costs as a result of liability concerns, they may decide to make up for that by driving up the price of the vehicles. So while autonomous vehicle owners could save money on their insurance policies, the cost may end up trickling down to the price on their new car. Furthermore, is it likely that once the prices of autonomous vehicles decrease there will be greater individual ownership, and thus the need for more individual coverage. In determining liability, AVs present new questions and opportunities with respect to data collection and management. Timely data sharing by auto manufacturers and other AV data collectors with insurance companies will be necessary to facilitate proper insurance coverage. Data could be used to establish the following: Liability in the event of an accident; accurate underwriting and pricing of insurance policies, and risk mitigation and control measures. Insurance companies will have to take a proactive approach to ensure timely data sharing and develop consumer perceptions on safety, liability, and coverage for AVs. Some experts predict that the frequency and severity of accidents will decline as autonomous vehicles become more prevalent. If the potential for accidents will be reduced, this should lead to lower overall premiums due to a lower risk of accidents. Many insurers already offer premium discounts for the safety features already provided by advanced driver assistance system. Thus, from a theoretical and logical standpoint at least, as the effects of increased safety become apparent, insurers may need to lower premiums to remain competitive. For a period of time many insureds may drive a variety of vehicles, including Level 0 vehicles fully controlled by the driver, and will need traditional permissive-driver liability protection. So the real question is, what happens during the intervening period when human drivers and partial and fully autonomous vehicles share the road? During this important transition period, a thoughtful compensation system is needed to prevent consumers from becoming mired in lengthy and expensive legal and technical disputes as to whether human error or technological malfunction caused any particular collision. Significantly, the lack of a timely and efficient compensation system will also stymie the adoption of AVs. Consistency in delivery, customer experience and expectations, with clear “rules of the road” (e.g., regulatory oversight, legal requirements), are vital to a rational risk transfer regime. If AVs and non-AVs are governed by different primary insurance structures or different liability standards, the resulting consumer confusion and regulatory/enforcement uncertainty will increase expenses associated with contentious liability determinations and market disruptions. Dividing the market in such a way would create a veritable patchwork on the roadways with respect to who is covered, for what, and under which regulatory and legal framework. Another implication on insurance is the possible, some say likely, decline in automobile ownership. Some experts believe that once autonomous vehicles are on the roads, they won’t be owned by individuals. Instead, technology companies such as Apple and Google, or ride-sharing services such as Uber and Lyft, will own them. Individuals will essentially use a “pay as you go” system, and use AVs as a taxi service or as an “Amtrak on wheels” ride sharing service. Insurance companies may have to shift their services from private vehicle owners to self-driving cars used commercially. However, as noted previously, once prices of AVs decrease there may be greater individual ownership. Further, the idea of joint ownership or sharing of property is something that is not ingrained in many counties or cultures. It will be interesting to see which countries adopt or favor joint ownership or joint use of AVs, and ownership of AVs by commercial companies such as Google or Uber versus countries that will be drawn to individual ownership of AVs. Insuring against infrastructure problems – insurance for cloud server systems that manage traffic and road networks, in addition to failure of external sensors and signals. NHTSA, Automated Driving Systems 2.0: A Vision for Safety. NHTSA, U.S. Department of Transportation Release “Preparing for the Future of Transportation: automated Vehicles 3.0” October 4, 2018. Do you have questions about your case involving autonomous vehicles? Contact the insurance defense lawyers at Thomas Paschos & Associates P.C. by filling out the online contact form or calling (856)-354-6040. Our attorneys have the knowledge and experience representing insurance companies and their insured. Our New Jersey office is conveniently located at 30 North Haddon Avenue, Suite 200, Haddonfield, NJ 08033 and our Pennsylvania office is located at 303 Chestnut Street, Philadelphia, PA 19106.